Corn silk represents silky long fibres that are at the top of the ear of corn. It is known for its healing properties. Tea made from corn silk is used as a remedy for bladder infections, urinary tract infections, prostate inflammation, the ejection of unpleasant stones from the kidneys, against urinating in bed, also has a beneficial effect on heart problems, reduces high blood pressure, relieves rheumatic pains, reduces fatigue and reduces bad cholesterol. It contains essential proteins, minerals, carbohydrates, vitamins and valuable fibre. It is an excellent diuretic (helps eject water from the body), so it can regulate blood sugar levels and help reduce various inflammation. What are the benefits of corn silk as a medicine? It is rich in vitamins K and C, minerals such as potassium and plant fibre. There are many ways you can use this ingredient. You pluck it by taking it from the freshly plucked corn. Spread it on a plate or tray, on which you have previously put a paper towel, and leave it to dry. Corn Silk is best to use fresh or freshly dried. Of course it is desirable to use corn silk, which is from domestic production, where you are assured of its quality, because corn purchased in a store is full of pesticides and poisons. It represents a mild, gentle and safe cure for bed wetting. Use tea or tincture (4 or 5 hours before going to bed), to strengthen the weakened urinary system. You can also make a combination of plantain and yarrow for even better effect. Remember there are different reasons for bedwetting, such as allergies, poor diet, deeper medical problems, and stress. In the event that corn silk does not solve the problem in a few weeks of use, we suggest that you examine the deeper problems. It acts anti-inflammatory and protects and soothes the urinary tract and kidneys. It acts as a diuretic and speeds up the production of urine, without adding irritation to irritated urinary tract. For the treatment of inflamed urinary tract corn silk can be combined with sage. For cystitis it is a good combination of corn silk and yarrow (milfoil). In case you have serious problems you are advised to contact the chosen doctor, especially if blood appears in the urine and pain. These teas and tinctures can be used as an aid in these cases, but certainly you have to tell the doctor that you want to use them regularly with the prescribed therapy. In combination with marshmallow corn silk can be used as a drug that will help to expel stones from the kidneys. If you use corn silk tea over a long period of time, it makes it easier to eject stones. Many of us know how painful the process may be, and if you do not do anything to ease the passage of the stones, it will get even worse. This tea is a diuretic, so the whole process is faster and easier. Corn silk prepared as a tea will help you to remove stones and sands from the kidneys, ease premenstrual discomfort, alleviate inflammation in the urinary tract. It has a beneficial effect on your entire body and facilitates the problems that have unfortunately become common in a large proportion of the population. Take one tablespoon of fresh chopped corn silk per cup of almost boiling water. Cover and let it sit for about fifteen minutes, or until it is cool enough to be drunk. Strain and sweeten with honey to taste. If you have made a larger amount of it, you can leave it in the refrigerator for two to three days. Daily dose varies on the type of your body and weight, but generally it is recommended for adults to drink one cup two to three times a day, but you should avoid this tea for a few hours before going to bed. Corn silk for children should be dosed in small quantities. 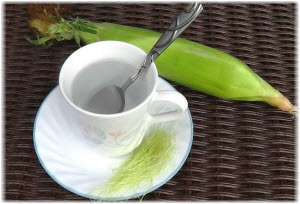 Tea made from corn silk for weight loss is a simple and natural way to reduce weight. It has natural anti-oxidant properties and is a good diuretic, so it helps to get rid of toxins from the body, and remove excess fluid, thereby speeding up the metabolism and helps in reducing weight, women are also recommended corn silk against cellulite. How do you make corn silk tincture? Fill a jar or other glass container with fresh chopped corn silk (one quarter).The rest of the container fill with alcohol with high alcohol percentage such as vodka. Cover and let it stand in a dark and cool place four to six weeks, occasionally shake the jar. Strain and corn silk tincture is ready for use. Dosage is 1/4 to 1/2 a teaspoon several times a day. For children, use a smaller amount. Corn silk can be mixed with a little local honey, to make it easy to drink. Shelf life of thus prepared corn silk tincture is more than a year. Another way to make a tincture, which includes corn silk is to use vegetable glycerine instead of alcohol. Glycerine is a better solution for use in children, pets and people who simply want to avoid the use of alcohol. Use approximately two to three times the amount of glycerine from corn silk, mix in a blender. Pour into a jar, cover and let it stand in a cool, dark place, except that you need to shake the container every day. After two weeks, strain the mixture through a fine sieve, or a couple of layers of gauze. The recommended dose is also 1/4 to 1/2 a teaspoon couple times a day, small doses of tincture of corn silk are recommended for children. The shelf life is about a year. Many have experiences with this tea, we bring you a few comments. For years, I had to fight with joint inflammation and swelling of the legs. When I found out that tea from corn silk can help with these problems, I immediately started using it. I was surprised how quickly it helped me! After a few days the pain and swelling decreased and I stood to my feet! I recommend it to all acquaintances! S.S. I'm struggling with the sand in the kidney for a long time, but at the end the sand turned into stones. Hell began when the stone started to move. Otherwise I rarely suffer some pain and disease, but this has knocked me off my feet. It is a serious problem until I ended up in the emergency in pain so strong that I could not stand, pale as a sheet. D.V. After a variety of pain killers and infusions and going home, I started to drink large amounts of corn silk tea on a recommendation of a friend and after a week and a half ago I was able to eject a stone the size of rice. I think the corn silk accelerates the process of expulsion, and also reduces pain. M.M. If you have an allergy to corn or if you drink a prescribed diuretic, do not use corn silk. If you have any other health problems, if you are breastfeeding or you are pregnant, you are torment by allergy to pollen or some other problem, and we recommend that you check with your doctor whether if corn silk is a good choice for you.